Task Force Rock was surrounded on all sides. It was a cool day in mid-March 2010 in eastern Afghanistan’s Chowkay Valley. With me tagging along as an embedded reporter, the U.S. Army task force—around 40 men and a dozen armored trucks from the 173rd Airborne Brigade—had driven into the Chowkay to discuss security with local elders. But the Taliban had other ideas. Insurgent fighters climbed the hills surrounding our position and, as U.S. radio intercept teams listened in, discussed their ambush plan. Caught out in the open, Task Force Rock’s soldiers dove for cover among boulders. An Air Force airman attached to the Army unit attempted to call in an F-15 fighter-bomber, but the mountains blocked his radio signal. Help came in the form of two Army OH-58D Kiowa Warrior scout helicopters. They buzzed into the valley low and fast, at times actually flying below our position on the sloping valley wall. The sweet sight of these savior helicopters could soon become a thing of the past, if the Army advances a controversial plan to replace the OH-58Ds with robots and other rotorcraft. Pulling up at the last second to avoid hitting the Chowkay’s slopes, the two-man copters fired phosphorous rockets, blasting the Taliban positions with the white-hot incendiaries. Under the cover of the Kiowa Warriors, we sprinted to the trucks and sped out of the valley. “I can’t believe we didn’t get shot at,” one trooper mused breathlessly. We had the maneuverable helicopters and their brave crews to thank for our narrow escape. Similar aerial rescues have taken place countless times in 13 years of war in Iraq and Afghanistan. The Army’s Kiowa Warriors, rebuilt versions of Vietnam-vintage scout copters, have been among the most responsive and most indispensable American weapon systems. The nimble, single-engine rotorcraft have spotted insurgent ambushers, escorted convoys and fired guns and rockets to turn the tide of deadly urban battles. The Kiowa Warriors, built by Bell, have flown nearly a million hours in combat since 2001—that’s around two hours per day, every day, for each of the roughly 100 OH-58s deployed to war zones. Scores of the 34-foot-long copters have been shot down or crashed in battle. Today the Army has just over 300 OH-58Ds, down from a pre-war inventory of 368. But soon there could be no more Kiowa Warriors in U.S. service. In a surprise move, the Army is proposing to eliminate all the OH-58Ds in the next couple years and replace them with Unmanned Aerial Systems along with upgraded Boeing AH-64 Apache attack helicopters, which are much larger and heavier than the Kiowas and typically do not fly as low. Part of a sweeping reorganization meant to shrink and upgrade the Army and save billions of dollars, the plan to “divest” the Kiowa Warriors has met with fierce resistance from inside the Army. But the Army brass argues that the Kiowa Warrior is too old and too vulnerable to survive in future wars—and that the Army aerial scout force’s greatest strength has always been its crews, not its hardware. With the current era of war rapidly coming to an end and military budgets falling fast, Army leaders insist the time is right to retire the 40-year-old OH-58Ds and replace them with something cheaper, safer and—according to the leaders—better. The plan is this: retire all 300 OH-58Ds along with 500 other old, single-engine Army helicopters—OH-58A/C and TH-67A training models, mostly—and quickly transition Army aviation to a slightly smaller fleet composed of twin-engine helicopters mostly built in the past 15 years, including UH-72A trainers, UH-60M and CH-47F transports and AH-64E gunships. The revamped fleet will number just under 4,000 helicopters, still the largest rotary-wing force in the world, by far. At the same time, the Army is cancelling plans to eliminate more than 200 small RQ-7 Shadow drones. 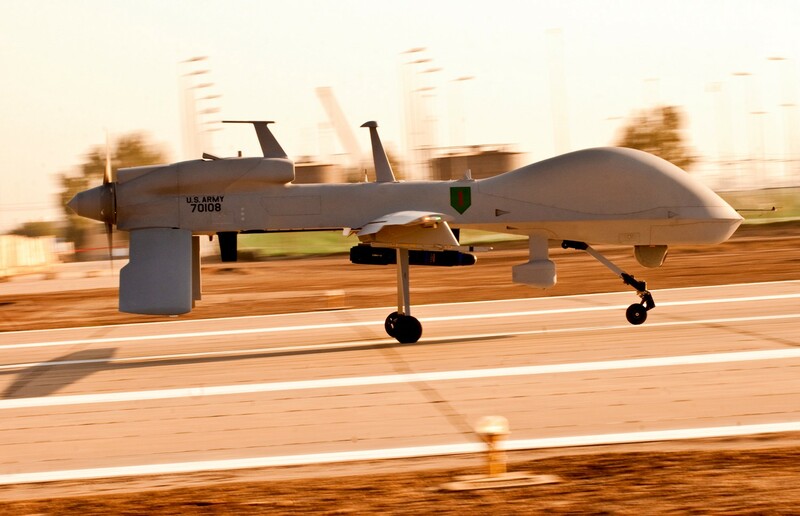 They and around 150 larger MQ-1C Gray Eagle aerial robots—essentially Army versions of the Air Force’s Predator—will step into the Kiowa Warrior’s role alongside Apaches flown by former OH-58D crews. The Apaches are being modified to control the drones and download video from them while 50 miles away or farther. The idea is for the fuel-efficient robots to patrol for long periods of time and in areas too well-defended for a manned helicopter, alerting the Apaches to zoom in and fire missiles and guns when necessary … and when safe to do so. As a bonus, the 28-foot-long Gray Eagles can fire Hellfire missiles on their own. The Army is also studying ways to add small bombs or missiles to the 11-foot Shadows. The drones-for-copters swap will save the Army at least a billion dollars in the near term and help the ground combat branch stay within projected budgets, according to Col. John Lindsay, a former Apache pilot and the director of Army aviation at the Pentagon. But the reorganization is also meant to create a better combat force—one able to fight against all foes in all environments without exposing crews to unnecessary risk. The Army contends that the Kiowa Warrior, for all its accomplishments, is an outdated single-engine design in a world of modern, twin-engine helicopters and high-endurance drones. So Lindsay says the Army wants to scrap the Kiowa Warrior but keep many of its pilots, retraining them to fly the more powerful Apache in a way that’s appropriate for the scouting mission, which requires very close coordination with ground troops—as seen in my video above, shot during an OH-58D-supported mission in southern Afghanistan in April 2013. Indeed, some Apache crews already think that way. 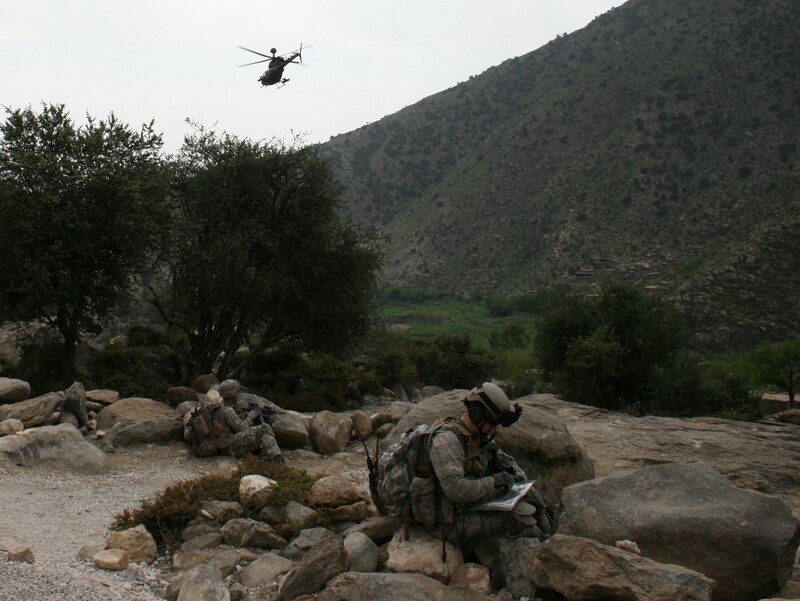 I was with a foot patrol from the 101st Airborne Division in eastern Afghanistan’s Paktika province in April 2011 when Taliban fighters attacked. A pair of AH-64s swooped in, one circling high overhead to cover the area with its swiveling, nose-mounted sensors and gun, the other hovering just 20 feet over the soldiers’ heads, its noise and sheer power a terrifying deterrent. Besides preserving the scout mindset and therefore the scout mission, keeping hundreds of OH-58D fliers in the Army could also help the ground service meet its overall aircrew requirement despite budget cuts in the flight training program. To save money, the Army is reducing its annual pilot production from 1,200 to just 600, Lindsay says. True, aerial drones currently lack the visual acuity and on-board processing—i.e., brain power—of a human pilot. And while they can patrol for far longer than a manned aircraft, they can’t carry as many weapons, fly as fast or absorb as much damage. Plus, there are the cultural obstacles to robot usage. Many soldiers prefer to perform a task with their own two hands rather than training on, taking responsibility for, deploying and repairing a potentially expensive, complex and fragile unmanned system. It’s not for no reason that, as elements of the Army’s 3rd Battalion, 41st Infantry Regiment—part of the 1st Armored Division—packed up and closed their combat outpost in southern Afghanistan in April 2013, they discovered several pristine Puma drones in storage, each purchased at a cost of at least $400,000 but apparently never flown. Lindsay says there’s a plan to remedy this robot neglect. The Army wants to move the Shadow and Gray Eagle drones and their operators, once part of their own specialized units, into the same traditional aviation battalions that operate the Apaches. These battalions train and fight in close conjunction with infantry and armor units. Peter Singer, an author and robotics expert at The Brookings Institution in Washington, D.C., says we shouldn’t directly compare the drones to the Kiowa Warriors they will partially replace. Rather, it’s important to ask whether a robot can achieve the same effect as an old-school scout helicopter, even if it does so in a different way. “The overall promise of a technology is frequently judged by, and therefore conceptually limited to, the original context in which it was first used, rather than new situations and roles,” Singer explains. From that point of view, there’s no fundamental reason a robot can’t do what the OH-58D does today: look for targets and help protect the ground troops using light weapons. The drone’s methods might be different, but the effect could be roughly the same … if not better. For example, an unmanned aircraft might not carry as much ordnance as a manned copter—and there certainly won’t be a pilot leaning out of a window firing a carbine—but it can fly far longer missions, patiently scanning the battlefield for half a day or more before refueling. By contrast, manned helicopters typically fly no more than a couple of hours at a time. The bottom line, according to the Army, is that drones can be scouts. And together with the upgraded Apaches, they can be better scouts than the four-decade-old Kiowas and their admittedly fearless crews, Lindsay says. My new book Shadow Wars is out. Sign up for a daily War is Boring email update here. Subscribe to WIB’s RSS feed here and follow the main page here.